“Stranger Things” star Millie Bobby Brown has apparently left Twitter. 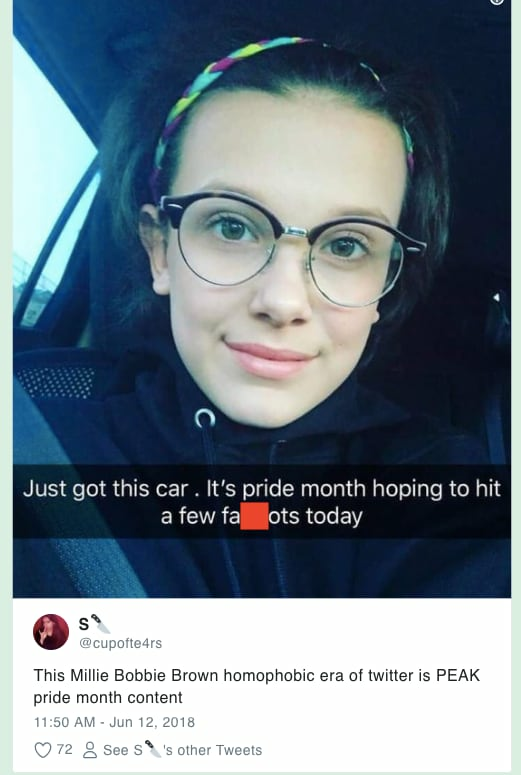 When TheWrap tried to access her verified account, @milliebbrown, on Wednesday, a blue Twitter page came up saying the page “doesn’t exist.” The page went missing after multiple images of the actress were turned into anti-gay tweets, culminating in a meme that gained steam on the social media platform. In reality, Brown is an active supporter of LGBT rights as well as an anti-bullying advocate. She wore an LGBT pin to the MTV Awards in 2017 and started a secondary Twitter account, @Milliestopshate, last summer to prevent bullying and cyberbullying. Brown is active on social media, with millions of followers on both Instagram and Twitter. She is best known for her breakout role as the telekinetic teenager Eleven in the hit Netflix series “Stranger Things,” for which she received an Emmy nomination for Outstanding Supporting Actress in 2017. She will make her feature film debut in the upcoming 2019 “Godzilla” sequel, titled “Godzilla: King of the Monsters.” She is also the youngest person ever to feature on TIME’s list of the 100 most influential people in the world. Many on Twitter attributed the images of the anti-gay meme to members of the LGBT community, suggesting it’s an in-joke among part of the gay community. Brown’s fans were quick to come to Brown’s support in the wake of her apparent decision to deactivate her account. all of y’all who deadass bullied millie bobby brown so much that she had to deactivate her twitter are disgusting, she is a CHILD ??? whats it like being an adult who bullies a fourteen year old girl?? jesus. A representative for Brown did not immediately respond to TheWrap’s request for comment. "Stranger Things 2" is packed with everything from small nods to full-on homage scenes to classic films, from the 1980s when the show is set, and beyond. 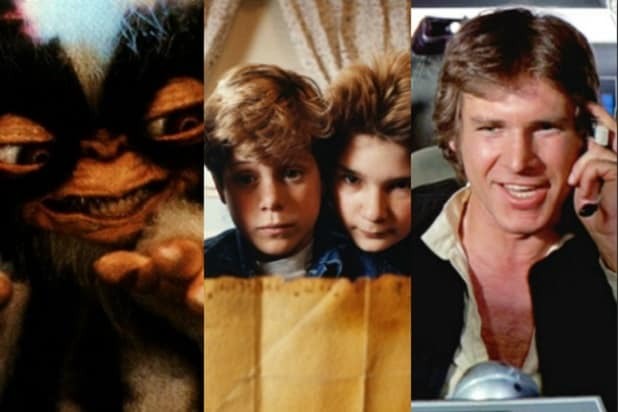 Here's a comprehensive list of all the movie homages in the show's second season. Max borrows the name of Mel Gibson's iconic character, and later Keith (Matty Cardarople) calls her "Road Warrior," a reference to the second "Mad Max" movie. The kids are still a year away from the most ridiculous film in the series, Tina Turner's "Mad Max: Beyond Thunderdome," though. Passing through Hawkins, it's possible to catch a glimpse of a movie marquis showing James Cameron's killer robot action-horror title. The show picks up on the real-world opening weekend of "The Terminator." Mike (Finn Wolfhard) spends some time in his basement in Season 1, reminiscing about Eleven (Millie Bobby Brown), who's been missing for almost a year. As he goes through his toys, he picks up his Kenner Millennium Falcon toy from 1979. It's the one that Eleven moved with her mind back in Season 1. During his first interview with Dr. Owens (Paul Reiser) that audiences see, Will (Noah Schnapp) mentions that his favorite Halloween candy is Reese's Pieces. While not the most direct of "E.T." references, the popularity of the film also caused a spike in the popularity of the candy. Later, we'll see an E.T. toy in the bedroom of Lucas (Caleb McLaughlin), as well. Cutting holes in a sheet to create a ghost costume is hardly a new idea, but Eleven appearing as a pint-sized ghost is a visual gag that's hard to separate from the same idea that appeared in "E.T." In the movie, the kids use the ghost costume to disguise their alien friend, and Eleven wants to use it to hide her identity in the same way. Bob (Sean Astin) hands over his JVC video camera to Jonathan (Charlie Heaton) to use when he takes Will and the other kids trick-or-treating. It's the same model camera that Doc Brown gives to Marty McFly to record Doc's first Delorean time travel experiment in "Back to the Future." The kids' coordinated "Ghostbusters" outfits are pretty on-point, and have some fun do-it-yourself nods built in since the movie would have only been out a few months in 1984. For instance, it's possible to see the spray paint and foam that went into the construction of the proton packs, which is a great nod. The guys aren't the only ones with movie reference costumes. Max goes trick-or-treating dressed as villain Michael Myers from John Carpenter's 1978 slasher movie "Halloween." By 1984, when "Stranger Things 2" is set, there had been three movies in the "Halloween" franchise. Speaking of slashers on Halloween, one of the bigger kids who torments Will is dressed as "Friday the 13th" killer Jason Voorhees. The hockey mask look wasn't Jason's first, but he'd gotten his iconic look together by "Friday the 13th: Part III." It's impossible to see a creepy, static-covered TV with a kid's silhouette in front of it and not think of 1982's "Poltergeist." Eleven doesn't see ghosts in the static the way Carol Anne does in the movie, but she does use it to help her see people with her psychic remote viewing abilities. Dustin discovered a weird, (somewhat) cute slug tadpole in his garbage can, and turns it into a pet. But it's not long before D'art stops being cute and starts being trouble as eats more and more -- a lot like what happens to Gizmo and the other Mogwai in "Gremlins." A child leading a strange creature using a long trail of food? It's hard not to see more shades of "E.T." in Dustin's attempt to get D'art in the storm cellar using baloney slices. They're not Reese's Pieces, but the whole situation is visually and thematically similar. While Dustin's problem with D'art mirrors "Gremlins," D'art itself is a lot more like the creature in Ridley Scott's 1979 horror masterpiece "Alien." Steve Harrington even finds D'art's skin after he sheds to grow even bigger, recalling Brett's discovery right before's carried off in the 1979 film. Midway through "Stranger Things 2," Joyce (Winona Ryder) enlists Bob to help her decipher Will's drawings. When Mike explains that the goal is to "Find the X," Bob asks, "What's at the X, pirate treasure?" As a kid, Sean Astin hunted pirate treasure with his friends in the 1985 Richard Donner-directed movie "The Goonies." After Nancy (Natalia Dyer) and Jonathan bring their information to Murray (Brett Gelman), they stay the night in separate rooms. The scene in which they talk to themselves about their relationship plays almost exactly like a similar scene with Harrison Ford and Kate Capshaw in the 1984 movie "Indiana Jones and the Temple of Doom." Pop culture is full of references of Indiana Jones going back for his iconic hat mid-escape in "Temple of Doom," reaching under a closing stone doorway to snag it at the last second (the gag is a repeat from "Raiders of the Lost Ark," when Indy grabbed his whip). It's Hopper who goes back for his hat in "Stranger Things 2," after Hawkins Labs folks show up to help in the tunnels beneath Hawkins. Toward the end of "Stranger Things 2," Dr. Owens sends a group of soldiers down into the tunnels the vines leaking from the Upside Down are creating under Hawkins. They don't know the danger they're walking into or how useless their weapons will be, just like the Colonial Marines in James Cameron's 1986 movie "Aliens." At the same time the soldiers are in the tunnels, Mike realizes he needs to warn Dr. Owens about the danger the soldiers are in. He's subsequently held back by Marines while screaming about a trap -- a moment that looks and sounds a lot like Princess Leia's attempt to warn Luke Skywalker that he's walking into Darth Vader's trap in "The Empire Strikes Back" (1980). Father Merrin's procedure might not have involved space heaters, but tying Will to the bed in order to expel a dark spirit from within him draws a pretty bring line to "The Exorcist." Lucky for the Byers and Nancy, nobody has to fling themselves out a window to defeat the Shadow Monster. At the end of "Stranger Things 2," Dr. Owens sneaks in another "Star Wars" reference, although this one wasn't from the 1980s. Owens uses Han Solo's iconic line from 1977's "Star Wars." Here's Harrison Ford delivering it in the movie.